Disclosure: This is a sponsored review, I was invited to try this product in exchange for my honest review. All thoughts, opinions and expressions below are my own. This post may contain affiliate links. I'm a writer by nature so I write A LOT; sometimes that can be a good and a bad thing if you know what I mean. Anyway, Out of the ten million pens in my home (that I have no idea where they came from or where to find one when I need one) the UGLee Pen is by far my new favorite. In case you're wondering (I know you are) the UGLee Pen gets it's name from it's design; it's a Ultimate Grip, ergonomic pen designed by Dr. James Lee to aid in comfort and hand pain relief when writing. To me it's just a pen, ink comes out of it like it's suppose to when I write so I give it a thumbs up for that and the glittery gel grip feels really great when writing so that's a +. This super comfort pen comes in seven different colors and retails for about $20.00 for a pack of three. This product can be found on Amazon.com. 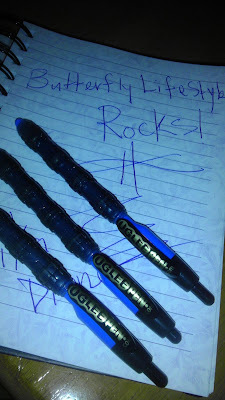 Like UGLee Pen on Facebook and follow them on Twitter for more information and product updates! Check out my UGLee Pen YouTube video below!